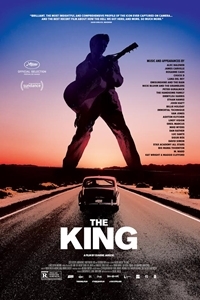 Forty years after the death of Elvis Presley, two-time Sundance Grand Jury winner Eugene Jarecki's new film takes the King's 1963 Rolls-Royce on a musical road trip across America. From Memphis to New York, Las Vegas, and beyond, the journey traces the rise and fall of Elvis as a metaphor for the country he left behind. In this groundbreaking film, Jarecki paints a visionary portrait of the state of the American Dream and a penetrating look at how the hell we got here. A diverse cast of Americans, both famous and non, join the journey, including Alec Baldwin, Rosanne Cash, Chuck D, Emmylou Harris, Ethan Hawke, Van Jones, Mike Myers, and Dan Rather, among many others.